It’s here, in hardcover and paperback. Greetings, faithful readers. 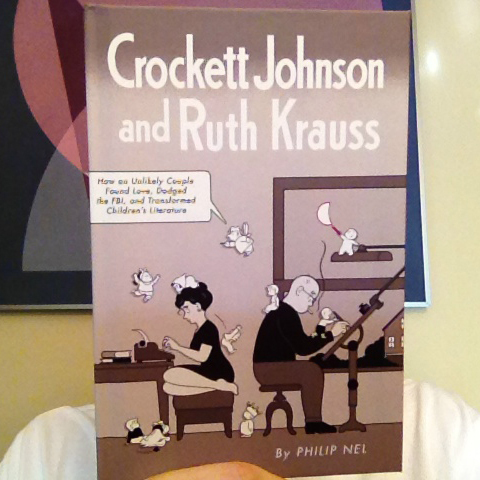 I am pleased to report that Crockett Johnson and Ruth Krauss: How an Unlikely Couple Found Love, Dodged the FBI, and Transformed Children’s Literature — a book that was twelve years in the making — now exists in both hardcover and paperback. I received my author copies today, which means that it should be available for shipping from warehouses in the next few weeks (the official publication date is September 1st). The author poses with the hardcover. The author poses with the softcover. It’s already available on the Kindle, Nook and SONY Reader, but I find the ebook’s absence of book design a little disappointing. So, I recommend purchasing the paperback. First, it’s cheaper. Second, only the paperback has the full wraparound cover (designed by Chris Ware). The Kindle version supplies only the front cover.1 On the hardcover, the artwork wraps around the spine and onto the back cover, but, since there is no dust jacket, the cover ends at the vertical edges of both back and front covers. The paperback also has no dust jacket, but does have folded flaps that mimic a dust jacket — they fold in along the vertical edges, tucking in between front cover and first page, and between last page and back cover. Thus, the paperback allows you to view the full wrap-around cover. Anyway. My point is that the book is now officially real. For me, a book is not a book until I hold it in my hands. It doesn’t matter that I’ve signed the contract, delivered the manuscript, edited the manuscript (many times in this case), obtained rights to reprint the images (88 for this one), checked the page proofs, or seen the image for the jacket. The book is only real for me at the moment I actually see a physical copy for the first time. For this book, that moment was late this afternoon. 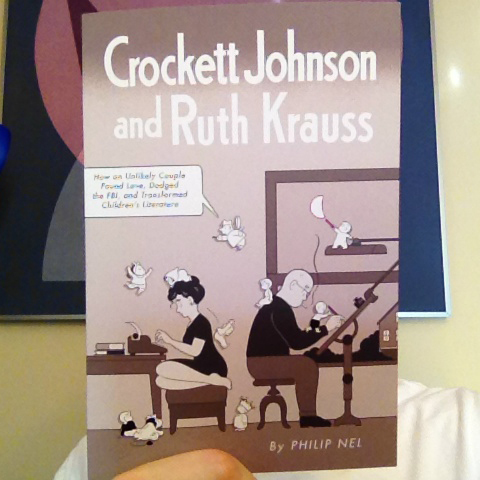 My biography of Crockett Johnson and Ruth Krauss is now real. 1. I haven’t seen the Nook or SONY Reader versions. I assume they look much as the Kindle version does, but cannot verify that assumption. Phil, C O N G R A T U L A T I O N S !!!!! Great! Looking forward to the purchase and the read. Hooray! And mazel tov! I am so excited to read it. Will order my copy pronto. Congratulations. It must be a huge feeling of relief – and now what is your next project? CONGRATULATIONS! I can’t wait to read it. I would like to purchase a SIGNED copy from the author! Thanks, Terry, Jake, and Janet! Terry: There are several projects, one of which is under contract. Eric Reynolds and I are co-editing The Complete Barnaby for Fantagraphics, collecting for the very first time, all ten years (1942-1952) of Crockett Johnson’s classic comic strip. The first volume (of five), should be out by this December (I hope!). It features an Introduction by Chris Ware (who did the cover of the book you see above), design and cover by Daniel Clowes, a short essay by comics scholar Jeet Heer, and an afterword and notes by me. Jake & Janet: Glad of course to sign copies! While I personally don’t have any for sale (the publisher handles distribution), I’d be glad to obtain & deliver copies when I see you both later this fall — if that works for you? A signed copy of son Phil’s book is to read with great pride and pleasure. What has happened to the new Barnaby book? I was given an availability date of August 22 2012 – but no sign yet. To the best of my knowledge, The Complete Barnaby Volume 1 will be out by December 2012. I still don’t have an official date from Fantagraphics myself, but should know more by month’s end. The main reason for the delay has been the challenge in getting all of these strips. There’s no “master archive,” and so we’ve had to rely on collectors & so on. But we do have the strips, and the book is in its design phase at the moment. So, in sum, all material is in, and it’s in the hands of the designers (both Dan Clowes, and designers at Fantagraphics). Or, at least, that’s the most recent information I have. Are any of the posters still available, and if so, how can I acquire one? Thanks…. Rich Erwin: Apologies for the delay in my reply. Yes, there are. Please drop me a line, using the email address at right (under “A note on mp3s,” above).